On March 28 last year I sat in the office of a marriage and family therapist’s office and explained how everything in my life seemed gray. Beyond stressed by work, the usual rainbows for me were buried behind ominous, dark clouds of depression. Just over a year later, one of those rainbows is about to pop through the darkness. 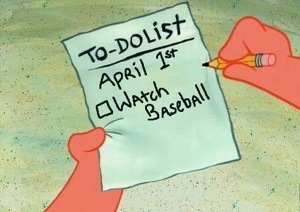 Today is Opening Day in Major League Baseball. Sure, there was a game last night, but watching the Texas Rangers take on the Houston Community College Astros is just one last Spring Training tune up, right? I fell in love with baseball when I was 8. I was in third grade at a new school and all of the boys I wanted to be friends with were California Angel fans. It was 1986. Wally Joyner took Orange County by storm and Wally World officially opened for business. He quickly became my favorite player. Lanky Mike Witt with his breath-taking curve balls was my favorite pitcher. My iPhone and iPad are named after them, respectively. I signed up for Little League the next season and played through high school. I’ve run a fantasy simulation baseball league since 1998, I have season tickets to Angel games and my wife just renewed our mlb.tv subscription for another year. I’m a huge baseball nerd. And I love it. For many baseball fans, today is earmarked with hope for their favorite teams. Everyone is tied for first. Maybe that big trade in the offseason will push your team into contending for the division. Or maybe that flashy prospect you’ve been drooling about in your farm system will be 2013’s Mike Trout or Bryce Harper. I make myself dig for hope now. My therapist told me that the loss of a chid is the worst loss one could ever experience. Our kids aren’t supposed to die before us. Looking forward to small things like Opening Day, Gray and Ellie’s t-ball classes or a night out with the boys gives me hope. I need something to look forward to in order to keep from hyper focusing on loss. Without hope I’d lay in bed all day clutching a bottle and smelling of death. The Angels open up today at Cincinnati against the Reds. Local hero Jered Weaver takes the mound with phenom Trout, the legend Albert Pujols and the big free agent Josh Hamilton behind him. Their hope is a World Series. My hope is to bask in the beauty of baseball for a day before the dark returns. This entry was posted in Grief, Life and tagged angels, baseball, bryce harper, grief recovery, hope, mike trout, mike witt, wally joyner by Seth. Bookmark the permalink. Seth, you are a amazing writer and I’m looking forward to hearing about your journey. Btw, I have mlb.tv, too. And it’s freaking awesome. Tell Luke he’s missing out.